Born to Eastern European immigrants in central California, Leo Krikorian’s first foray into art came courtesy of the US Army and the photographic training he underwent as part of his military service. At World War II’s end, Krikorian used his GI Bill benefits to pursue formal studies at the Art Center School in Los Angeles, taking classes from Ansel Adams. Drawn to the progressive philosophies of Black Mountain College, Krikorian enrolled for the 1947–1948 school year and received instruction from the college’s luminary leaders, Josef Albers and Ilya Bolotowsky. Both Albers and Bolotowsky were proponents of geometric abstraction, yet their teaching styles were diametrically different. Albers’s pedagogy emphasized formal methodology, while Bolotowsky’s approach was less theory-laden, a spontaneity Krikorian preferred. 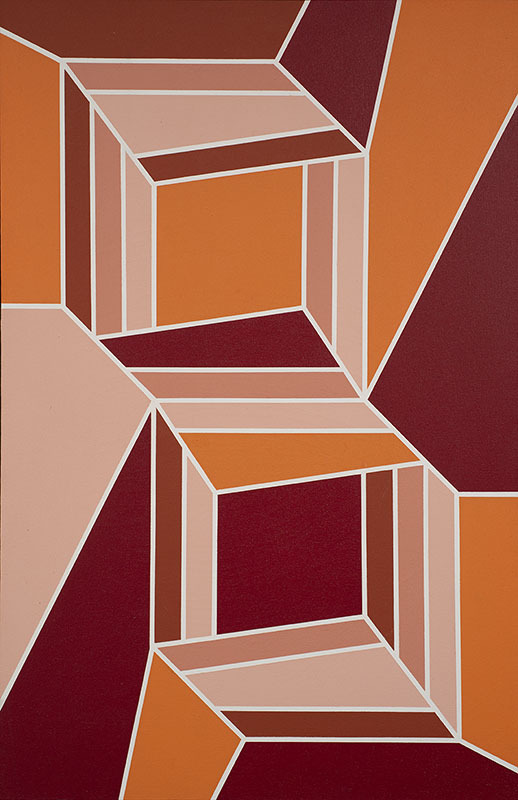 In their combination of analogous colors with hard-edged pattern, Krikorian’s paintings are an amalgamation of these mentors’ techniques. Following his time in North Carolina, Krikorian continued his education in photography, living briefly in New York and then matriculating at what is now the San Francisco Art Institute to study once again under Adams, as well as the Abstract Expressionist Clyfford Still and photographer Minor White. Facing financial constraints, Krikorian abandoned schooling for a two-year stint as a merchant seaman. In 1953, Krikorian—working in partnership with fellow Black Mountain College alumnus Knute Stiles—opened a popular bar known as “The Place” in San Francisco’s North Beach district. Part watering hole, part performance venue, and part gallery space, The Place became a central gathering spot for bohemian artists, jazz musicians (such as Dave Brubeck), and an array of Beat generation writers (including Allen Ginsberg and Jack Kerouac). After closing The Place in 1960, Krikorian operated a successful Sausalito deli, all the while concentrating on painting, photography, and filmmaking. From the 1970s on, Krikorian lived in both California and Paris, France, exhibiting throughout the United States and Europe. In many of the artist’s modern large-scale canvases executed during this period, the bold graphic quality of repeated symmetrical forms and flattened perspective create a sense of optical illusion, as illustrated in 127 EV, dated 1985.